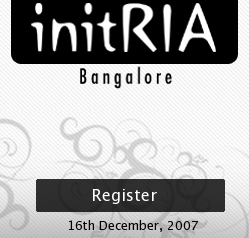 initRIA is a day long developer conference of Rich Internet Applications enthusiasts organized by the Bangalore Flex User Group. This is the first conference dedicated to Rich Internet Applications in India. Very exciting 🙂 and seems to be great event as i talk with Mrinal Wadhwa . And happy to design the logo of initRIA 🙂 . What topics can be talked about? The talks can be about any RIA technology AJAX, Flex, AIR, Silverlight, JavaFx or others. We are hoping to get a good mix of talks on different technologies. The nature of the talks has to technical in nature this is not a marketing event so no marketing mumbo jumbo please.